On a good day, you can reach Puerto Galera, Mindoro before lunch if you leave by around 8 a.m. If you’re lucky enough not to be the one driving, you can sleep on the way to Batangas and wake up in time to transfer to a boat. If you haven’t pushed your luck and were sensible enough to book a room in Buri Resort & Spa, a private boat will take you to their dock. Don’t forget to wave goodbye to the city noise. You’re about to enter a stress-free weekend of silence (in vibrant shades of green and blue). Galera is somewhat famous for being a party spot, but in Buri, the only party you will have is in the shower, where you are free to sing and dance all you want. Otherwise, you can make good use of the facilities to do things that would be cumbersome to do in the city. Swim. Try kayak-ing. If you’re feeling brave, skinny dip in the privacy of your own pool. The trek to get to the villas is steep. Perfect for burning calories. The resort has been around since 2001, starting out with only a handful of rooms for guests. Now, they’ve opened the Blue Bar, a spa area, and they’ve expanded to 12 native villas. And oh, what cozy villas they are. 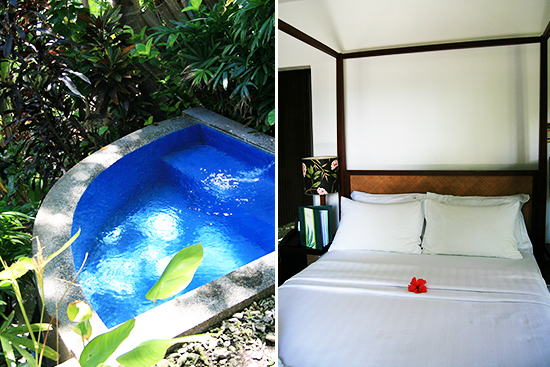 The pool villas have two spacious rooms for any variation of four people (a family with two kids, a group of friends composed of a couple and two potential threats to that relationship, et cetera), each with a personal bathroom, and are surrounded by thick greenery (trees, shrubs, and flowering plants). You’re surrounded by so much nature that you might feel that nagging fear that a monitor lizard will enter your room. It’s just that green and close to nature. Pool Villas come with, guess what, a pool. 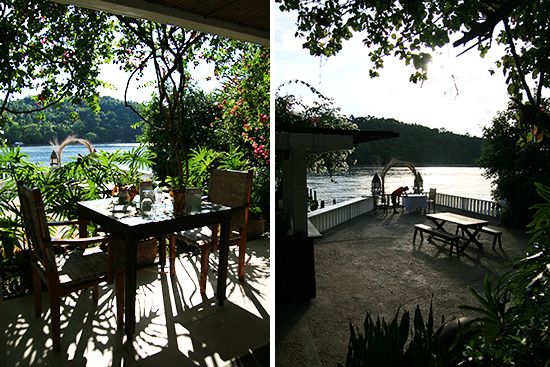 Speaking of which, everything you can do around the quiet side of Puerto Galera is only a boat ride away. The water is so clear that you can see the bottom (which is why the local government has offered glass bottom boat rides) and diving is an option you will want to take. You can snorkel to where giant clams are or scuba dive and see the coral reef. A trip to a Mangyan Village is a brief 20-minute ride from the town and there you can meet people of the Iraya tribe, who weave nito handicrafts (perfect souvenirs). The lush plants protect you from the sun while you’re dining at high noon. While the sun is setting, you can enjoy a romantic dinner or a happy gathering with the family on the porch. 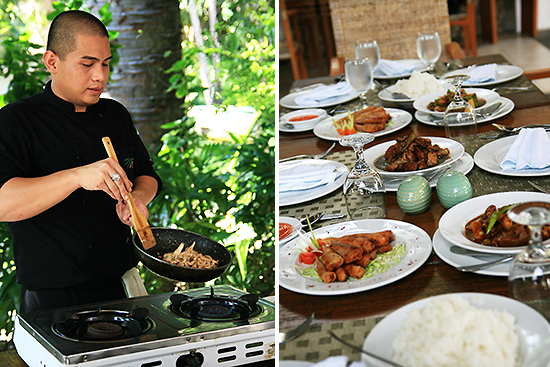 Being shameless foodies, one of the highlights of our stay in Buri was a meal with dishes prepared by Chef Wesley Valdez. His specials are based on the day’s catch, so everything is guaranteed fresh. One bite of the pan roasted snaper fillet in light wine sauce with herbs made us forget all thoughts of red meat. The fish is tender but thick and lean enough to chew, allowing you to savor the light buttery sauce. 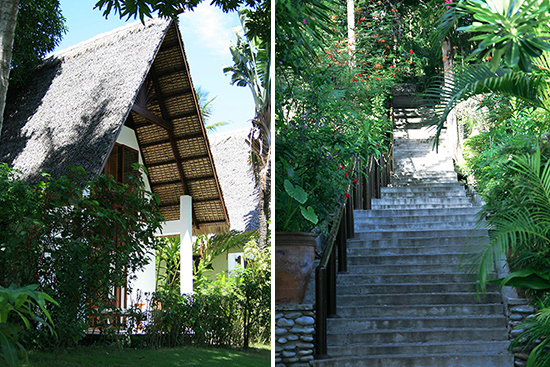 Buri Resort & Spa offers an enjoyable no-party experience of Puerto Galera. It’s so dang quiet, we can’t recommend it to people who can’t live without the discomfort of the city. The only caveat is, you’ll feel so relaxed, you might not want to leave your room. Not even to check out the pristine waters (which would be a shame, so do get up for an hour or so to say hi to nature). The resort currently offers a Limited-time Offer. 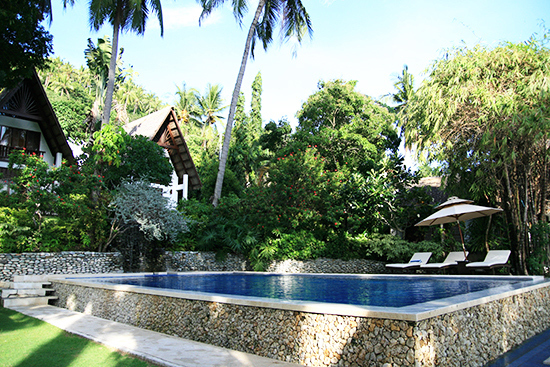 Rates are as follows: PHP 3,500 nett (Garden Villa) PHP 4,000 nett (Family Villa), and PHP 4,500 nett (Pool Villa). Buri Resorts & Spa also affords private transportation, including two-way van and boat transfers from Manila to Batangas to Buri and back. Guests have the option of taking a public boat transfer from Batangas Pier. For more information, log on to http://www.buri-resort.com/.